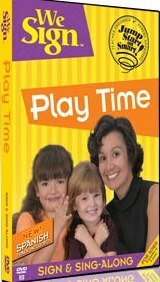 This DVD of songs and American Sign Language, ASL, is for older preschool and elementary school children. Everyone will learn signs for hundreds of animals along with hundreds of vocabulary words about the world, habitats and environments. Signing combined with music and spoken word is a powerful way to build vocabulary and support learning in a fun and playful way. Special features include: a Spanish language track, Instructor track, and more.